The Law Reform (Marriage & Divorce) Act 1976 came in force on 1st March 1982. 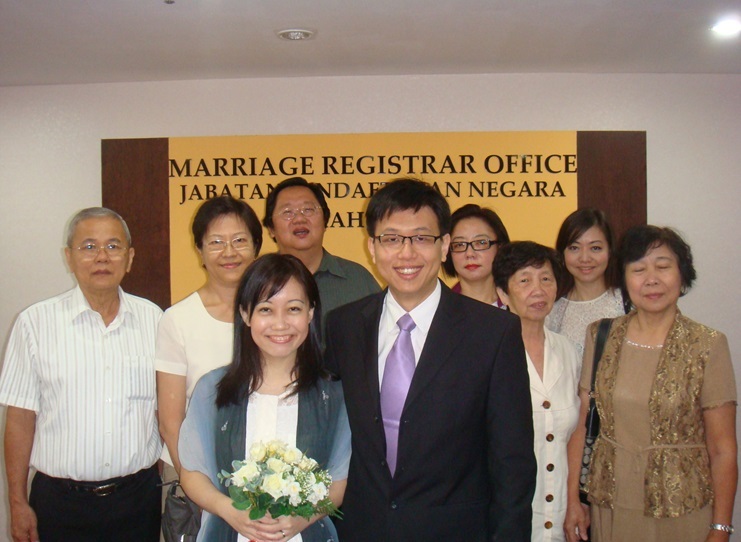 From that date The Malaysian law only recognizes civil marriages that are registered. This law is only applicable to non-Muslims. The purpose is to avoid cases of bigamy. For a list of Assistant Registrars of Marriages: Click Here, if you prefer to have the registration of marriage done at temples/ associations, etc. instead of NRD. 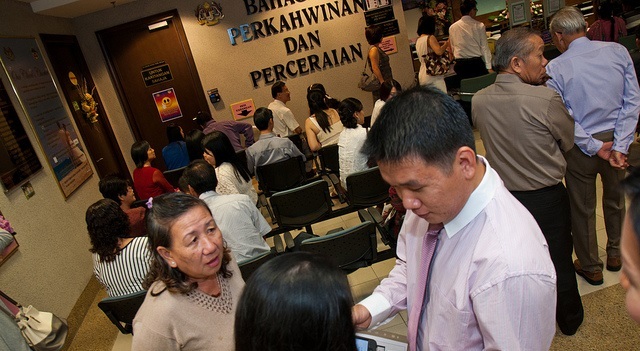 Malaysian couples who wish to register customary or religious marriages in churches, temples or associations are required to go to any National Registration Department office to confirm the information on the marriage application and to pay a fee of RM20.00 for the Marriage Register. More info: Registration of Marriage for Non-Muslim by JPN or NRD. 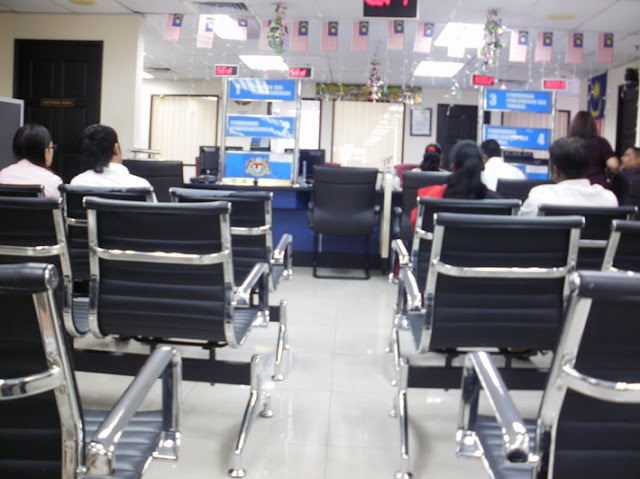 Application has to be made at the allocated NRD branch for the district of the address in the applicant's IC (MyKad). To avoid having to apply at different sites, the couple can alter the addresses in their IC to the same location (for example to their new residence). 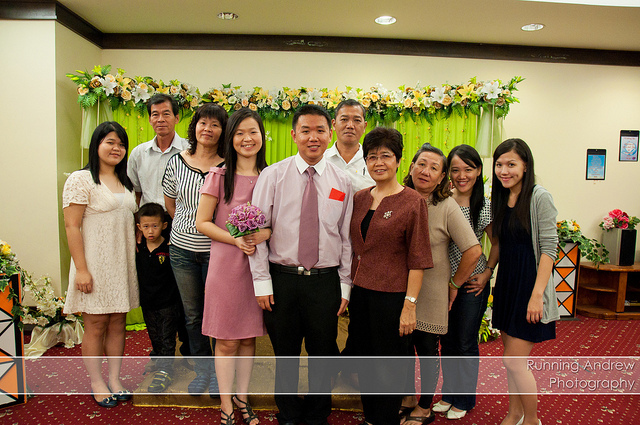 The ROM solemnization and signing of marriage contract ceremony can be done at either branch (bride or groom). If they wish to hold the ROM at a different branch, the application has to be sent over to that division. Marriage counters at state/district/sub-district NRD (National Registration Department) offices. *Here's a sample of the form: Borang Kahwin JPNKC02. Note: The online forms are to be used as reference only. They may not be printed and used for transaction purposes. For transactions, please use the original forms. b. Supporting documents must be attached to Form JPN.KC02: (A detailed Checklist click here). Get the documents certified by a Commissioner of Oath. Note: All photocopies are to be done on A4 size paper, not cut. Use the original size. For IC, photocopy both side of the card on one side of the paper. c. Sign the form and a statutory declaration (embodied in the form) stating that there is no lawful impediment to the marriage and that all the requirements have been complied with (eg: they are above the age of 21; if below the age of 21, the appropriate consent has been obtained, whether widower or widow) in front of the Registrar of Marriage. d. Submit to the Registrar together with a fee of RM30. a. The notice to be published by posting a copy in a conspicuous place in the registration office visible to the public. b. Anyone with a valid reason for objecting or preventing the registration of a marriage, can enter a Caveat with the Registrar of Marriages against the issue of a certificate for the marriage in respect of a person who has applied for a certificate of marriage. Note: The registration of marriage shall take place after 21 days + 1 day but not later than 6 months from the date of application, failing which the entire process will have to be repeated. a. Arrange for a date with the Department. b. The marriage need to be solemnized in the presence of at least two credible witness besides the Registrar. Your witnesses, who may be friends or relatives, must be citizens of Malaysia, at least 21 years of age and could understand the declarations made during the ceremony. Be decently and neatly dressed (T-shirt/jeans/flip-flops/shorts are NOT ALLOWED). If the Registrar of Marriages is satisfied that all the requirements have been complied with, he/ she shall issue a certificate for marriage. To be exempted from the 21-day notice and marriage declaration, they may apply for a special licence without marriage notification and declaration (Form: JPN.KC01C) from the marriage registration authority in the state concerned. Payment for this special licence on approval is RM100.00. If you choose to request the registrar to conduct the signing ceremony at a different location, for instance hotel, your home, other venue, there are more steps to be taken. Application for a licence to solemnise marriage in a place other than the office of the Registrar is to be made using Form JPN.KC01E (subject to the approval of the Chief Minister or Menteri Besar). A fee of RM500.00 will be charged if approved. Fill in form and make submission within one month. During submission the form and appointment with the officer for arrangement for external ROM, bring along witnesses NRIC copy (front and back) + bride and groom ICs + passport photo + JPN.KC02 form. Approval takes approximately 1-2 week, then you will have to wait for a JPN officer to be assigned. The arrangement of the time and place has to be negotiated with the officer as some only work during office hours. You can call the particular officer if you know one. My hubby also managed to convince the JPN officer to attend and witness our signing ceremony outside of JPN. It wasn't an easy tasks. So tedious and need to go a few round to JPN office in Shah Alam (got rejected the first time and my hubby went there again to reapply), PKNS (for some signature and chop) and submit back to JPN office, waited for available officer for confirmation… One word: Mess! But it is definitely worth it..
4) No need to prepare lunch or dinner after ROM as they can have their refreshment during the wedding dinner! 5) No need to incur extra costs for your ROM attire, photographer, make up artist. There are CONS too.. there are more procedures to apply ROM outside JPN office , you must make sure they are JPN officer willing to do it on their rest days and you pay extra (RM500 ++ instead of RM30) for your ROM. But with the pros i listed out above, is worth to pay the extra RM500++. We then call up one of the KL JPN officer which we got the contact from our friend, is an officer JPN dutamas (call the general line 03-6205 7600 ) to check whether he can do our ROM on his rest day. The officer who did for me is mr Ramani from dutamas jpn. He only can do for ROM at kl area. He is good, he will make ur ROM merrier n interesting. We then submit all the documents to him to process. Hi - I plan to have my solemnisation ceremony at the venue. Does anyone know the procedure on getting the registrar to solemnise my marriage outside of JPN? You need to find the following locations that have are authorized to solemnize weddings and give out certs. c) Other religious places that are authorized by JPN. Hi there. I have a question. I have changed my name in Mykad recently due to some numerology issue but mykad Chip is still carrying my old name cz JPN told me that they can only change my name on mykad but not in the chip. So which name will appear in my Marriage Registration Certificate in future ? Is it going to be my old name or my new name ? Kindly advise. Thank you. "Makluman: Borang dalam portal ini hanya untuk panduan. Tidak digalakkan untuk mencetak dan menggunakan borang tersebut untuk berurusan . Bagi urusan , sila gunakan borang asal "
Maybe you can update this wonderful website with this information as well. Thanks Ray for pointing that out. I have added the Note. as well as corrected the broken link. Hi , I am in the planning to get register in Putrajaya, I have a quick question here. If the registration done in Putrajaya, is that mean don't have to have the commision of oath approval which required by the other solemnize weddings places like temples? Ya, Can make it at home instead? Prefer to do it at my villa so I can invite my friend to join. Is it possible? Hi, is there nay specific DAY that the register marriage open for? I heard Putrajaya only will have register on Wedsnesday. Any inputs for this? can anyone tell me what's the operating hours?Thanks. I have done my ROM in Australia as my husband is Australian. I am a Malaysian wanted to get a legal marriage certificate/document in Malaysia using the same date i married in australia. Please advise what are the proceduce? What are the documents we need to prepare? Am marrying in korea. As far as i am concerned i'll just have to bring my korean marriage cert to malaysian embassy in korea. So maybe u'll have to call malaysian embassy in australia does it too. Doing it in malaysia is more complicated. A Man from USA holding green card and A lady from Myanmar who is working in Singapore want to officially marry in Malaysia. Is that possible?? And what things or documents are needed? ?